PROMO ENDED - A Selkie's Prayer is FREE on Kindle! A Selkie's Prayer is FREE on Kindle from October 31 - November 3, 2014. If you share the news with your friends/followers/dental hygienists (thanks, Dad! ), I would be OVER THE MOON. A Selkie's Prayer is a standalone novella in the world of Kinyn. When Jedrey's selkie wife accuses him of stealing her sealskin and leaves him, his world is shattered. A mysterious goddess puts a magical map in his head to help him search for his lost love--but his wife may be closer than he thinks. 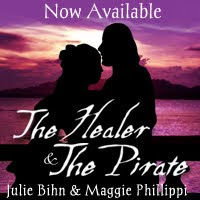 Also contains the first chapter of The Healer and the Pirate, Book 1 in the Kinyn Chronicles. A Selkie's Prayer is live on Kindle! 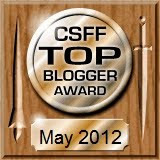 Julie one more time for the CSFF Blog Tour. This was a Blink book, which is an imprint Zonderkidz began for the general market. So it technically wasn't a Christian book, though I don't know how well Zonderkidz is doing letting readers know that. But that is why the Christian content is so low in this series. That was all news to me! I would argue that Blink's "About" page does very little to explain the books are for the general market, either. Blink is the brand new home of some of the most engrossing teen publishing anywhere. We publish some of the best writers we know, including Heather Burch, Jonathan Friesen, Lisa T. Bergren, Carey Corp and Lorie Langdon. While their books aren't called Christian, "positive reflection," "inspiring," "enrich," "uplift," and even "life well-lived" read to me as Christian buzzwords, and certainly don't sound like a secular publisher to me. Even if I didn't know they were linked to Zondervan, I would have guessed that there was some sort of Christian (or maybe LDS) background. I strongly agree that Christian writers can and sometimes should write secular fiction...many people would never dare pick up a "Christian" book, but if done right, a secular book can open a door. I imagine that for some readers, The Safe Lands series may serve as a good Christian witness, even with its subtle presentation on that front. And certainly, if any Christian author can do what Blink's official "mission" promises, I think they're doing well indeed. The Safe Lands series was indeed a positive reflection, heartening, imaginative and exciting, enriching, and made me (not the target audience) think about my own life too. So I think Williamson was an excellent fit for the imprint, indeed. I'm so glad she was able to bless us with her series. Here are the other participants in the blog tour!